Only a year later Mildred and Richard Loving realized that sharing a failure is a little more than nothing if an active and positive reaction doesn’t follow, to raise head and plan a comeback. It was the end of 1960, the last day of the year. Both had phoned their families for the usual greetings. Mildred's parents were with them during Christmas and then they returned to Virginia. At the stroke of midnight, standing before the glass of the small bedroom window, they intensely embrace each other, lengthening that moment forever. This phenomenon, according to Einstein, is scientifically justifiable only on the speed of light. However the feelings can be much more rapid than our brain. 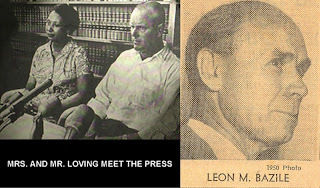 On January 6, 1959, the trial judge in the Lovings case was Leon Bazile. These are the words he said on that day: “Almighty God created the races white, black, yellow, Malay and red, and he placed them on separate continents. And but for the interference with his arrangement there would be no cause for such marriages. The fact that he separated the races shows that he did not intend for the races to mix. Richard Loving, Mildred Jeter, this Court condemns you to one year in prison, with the sentence suspended for 25 years on condition that you leave the state of Virginia.